03 night Accommodation in Athens. Private round trip transfers in Athens. Breakfast at the hotel. One for all you History buffs - discover Athens' Ancient history on this fascinating city walking tour with your local guide. Venture inside the ancient Acropolis and admire just how this ancient monument towers above the city below. You'll also see such sites as the House of Parliament and the Plaka as you soak up the local scene. Syntagma Metro station, where your tour begins contains many archaeological exhibits including ancient grave stones, an aqueduct from the 5th century BC, pottery, a 2,000-year old beehive and a mosaic from the 5th century AD. On this half day tour you'll have the chance to see many of the main sights of Athens. Your first stop will be the Stadium Panatenaico of Athens, where the first Modern Olympic Games took place in 1896. Then on to the Zeus Temple (Father of The Gods), followed with panoramic views of the main avenues. You then proceed to the Parliament with the Tomb of the unknown soldier, where the changing of the guards take place. You will also have the opportunity to see the Museum of Coins, the Catholic Cathedral, Schliemann's House (who discovered Troya), the Academy, the University and the National Library. Next is to the famous Acropolis, where you will visit the Temples. The tour begins inside your hotel lobby where your guide will explain to you the paths of this tour. You will then be taken to the start point to begin your walking tour of Athens. Begin at the House of the Greek parliament and the Monument to the Unknown Soldier and watch the changing of the guards. Your tour then continues towards the National Gardens passing by the Anglican church of St Paul and on to the beautiful neoclassical Zappeion Hall, in front of which tower the surviving columns of the Temple of Zeus and Hadrian's Arch, both of which you will have an opportunity to visit. From there you enter the famous Plaka district where you see the portrait of Melina Merkouri. After we head towards the beautiful pedestrian walk way of Dionyssiou Areopagitou until we reach the Acropolis where we will begin our ascent while taking in the spectacular views of the city below. Your guide will give you a detailed explanation into the glorious monuments of the Acropolis such as the Parthenon, Erection, Propylaia, Nike Temple and the surrounding monuments (such as Dionysus sanctuary, Philopappos Hill, Mars Hill, Observatory, Pnyx Hill, Odeon of Herodes Atticus, Ancient Agora). Your tour will end at the New Acropolis Museum, a must see for anybody visiting the city and the best way to complete your city tour of Athens, with its 4,000 artifacts on display and excavations visible under stunning glass floors. Visit the picturesque villages and towns of central Greece as you travel to Delphi and Meteora on this 3 day tour, with half board accommodation (staying in a 4 star hotel) included. Day 1: Leave for Delphi via Thebes, Levadia and the picturesque village of Arachova, on the slopes of Mount Parnassus. Upon arrival in Delphi you will visit the sanctuary of Apollo Pythios, (Treasury of the Athenians, Temple of Apollo etc) and the Museum. Afternoon free for leisure. Enjoy dinner and stay overnight in Delphi. Day 2 : Morning free for leisure. Leave Delphi for an interesting trip through Central Greece to the towns of Lamia to Kalambaka. Enjoy dinner and overnight stay. Day 3 : Visit Meteora with its particularly impressive scenery and ageless Monasteries, containing priceless historical and religious treasures and stand suspended between earth and sky, on top of granite rocks. Return to Athens via Trikala, Lamia and Thermopylae (with a short stop to see the Leonida's Monument). You will arrive in Athens early in the evening. The tour begins inside your hotel lobby where your guide will explain to you the paths of this tour. You will then be taken to the start point to begin your walking tour of Athens. Begin at the House of the Greek parliament and the Monument to the Unknown Soldier and watch the changing of the guards. Your tour then continues towards the National Gardens passing by the Anglican church of St Paul and on to the beautiful neoclassical Zappeion Hall, in front of which tower the surviving columns of the Temple of Zeus and Hadrian's Arch, both of which you will have an opportunity to visit. From there you enter the famous Plaka district where you see the portrait of Melina Merkouri. After we head towards the beautiful pedestrian walk way of Dionyssiou Areopagitou until we reach the Acropolis where we will begin our ascent while taking in the spectacular views of the city below. 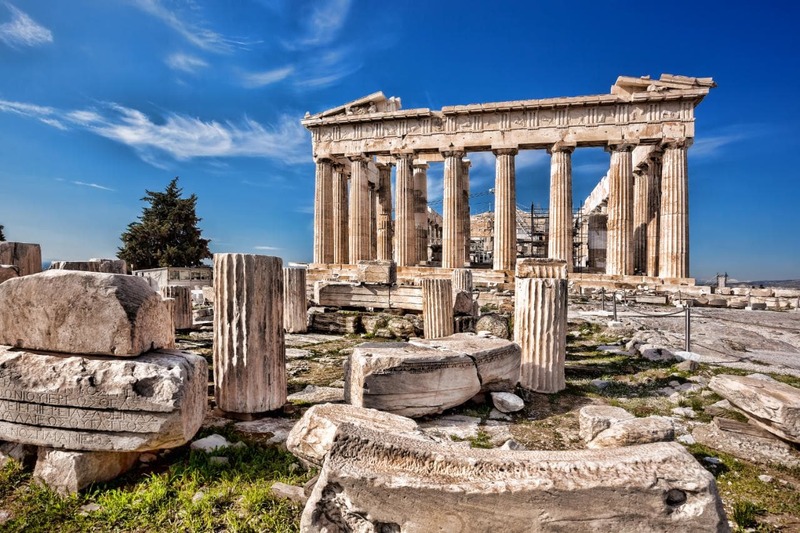 Your guide will give you a detailed explanation into the glorious monuments of the Acropolis such as the Parthenon, Erection, Propylaia, Nike Temple and the surrounding monuments (such as Dionysus sanctuary, Philopappos Hill, Mars Hill, Observatory, Pnyx Hill, Odeon of Herodes Atticus, Ancient Agora). City Sightseeing is the World's number one Open-Top bus operator, with sightseeing tours in more than 90 locations carrying well over 10 million passengers per year. This Athens city tour provides the perfect way to see all the best sights and attractions of the city, allowing you to hop on and off at any one of the 15 stops en-route. The Athens Line Hop on Hop Off Tour operates daily and runs every 15 minutes in summer and every 30 minutes in winter, including headphone commentary in 12 languages and offers a great and flexible way to see the city at your own pace. This ticket is valid for 2 days (24 hour ticket plus one day completely free!). Meet and assist at Athens International Airport and transfer to your hotel. Rest of the day is yours to spend to explore this fascinating city.Athens. A magical city. The city with the most glorious history in the world is worshipped by gods and people. The enchanting capital of Greece has always been the birthplace of civilization. It is the city where democracy and most of the wise men of ancient times were born. The most important civilization of the ancient world flourished in Athens and relives through superb architectural masterpieces. Optional Athens by Night Tour. Accommodation in Athens. From the Acropolis to Omonia Square, with the half-day Athens sightseeing and Acropolis museum tour you'll see all the famous sites of ancient and modern Athens on this comprehensive morning tour. Offering a perfect overview of the city, this guided half-day tour, the only one which includes headphone system will help you get your bearings if this is your first visit to Athens. We start with a photo stop at Panathinaikon Stadium where the first modern Olympic Games took place in 1896. It is the only stadium in the world that is built out of white marble. We then proceed, passing by Zappeion and The Temple of Olympian Zeus. We will then pass the Athens Trilogy which includes the University of Athens, the Academy of Athens and the National Library. We Continue passing by the National Garden, Hadrian’s Arch, St. Paul’s Church, The Parliament, The Tomb of the Unknown soldier, Schliemann’s House (Numismatic Museum), Catholic Cathedral, Old Parliament, Constitution Square, Russian Orthodox Church, and finally the ACROPOLIS where we will visit Propylaea, Temple of Athena Nike, Parthenon, and the Erechtheion with its Porch of Maidens). We continue the tour with a short pleasant walk passing by the Herodion and Dionysus Theater in order to visit the ACROPOLIS museum. We skip the lines of the new museum and proceed to see the main attractions such as votives, artifacts of everyday life, statues from archaic period, Caryatids, and of course the Parthenon hall with the metopes, the pediments and the frieze that will amaze you. Evening free or optional Cape Sounion or Athens by Night tour. Accommodation in Athens. Day at leisure to relax or do an optional tour. Recommended options include Full Day Delphi / Full Day Argolis or the Full Day Cruise. Accommodation in Athens. Today, after breakfast you will check out from your hotel and be transferred to Athens Airport for your flight out.